I did, in fact, read it quite thoroughly, and I realize that a lot of people couldn't handle the responsibility of weaning a parrot, but I also realize that if you are instructed and careful you can successfully wean a parrot by yourself. Now please don't take offense at this next sentence, because I mean no offense by it; but I have noticed that people on this forum tend to be rather aggressive towards two certain issues: one, that it is better for you to flight your parrot (I don't really take a side in that argument, as I have had flighted and un-flighted birds), and that is a bad idea to wean your own parrot. I realize that there are good reasons for a lot of people not to wean their parrots, but I also think that with the proper training you can. As I've said, whether or not your parrot bonds to you afterwards really depends on the parrot. I hope this doesn't offend too many people. Last edited by Aloysius on Sat Aug 18, 2012 6:53 pm, edited 2 times in total. I'm still blown away that one can buy a parrot that isn't weaned. I had a number of people ask me for my birds earlier and there was NO WAY I would do that. I guess it comes down to how responsible the breeder is. Please don't take offense to the above its just my view and that's it. I couldn't imagine any of our birds leaving earlier than they need to. Besides I've noticed all the little ones seem to interact with each other and learn from one another. That's something that they will miss out on if they leave the nest too early. there is no reason to buy an unweaned parrot, but there are many reasons not to. maybe research and start from the beginning of this topic. Aloysius wrote: I actually did read it quite thoroughly, and I realize that a lot of people couldn't handle the responsibility of weaning a parrot, but I also realize that if you are instructed and careful you can successfully wean a parrot by yourself. Now please don't take offense at this next sentence, because I mean no offense by it; but I have noticed that people on this forum tend to be rather aggressive towards two certain issues: one, that it is better for you to flight your parrot (I don't really take a side in that argument, as I have had flighted and un-flighted birds), and that is a horrendous idea that you could wean your own parrot. 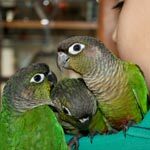 I realize that there are good reasons for a lot of people not to wean their parrots, but I also think that with the proper training you can. As I've said, whether or not your parrot bonds to you afterwards really depends on the parrot. I hope this doesn't offend too many people. There is a reason why it is illegal to sell unweaned babies.... Laws aren't made just for the hell of it. Training or no training to wean it makes no difference to how well they bond and they should be with their clutch mates, playing, learning to sort disputes or form heirachies, socializing and generally learning how to be a bird. its a well known fact that interfering with nature by removing eggs from nest, babies from nest to rear increases the risk of pyschological issues. Why increase that risk even more by taking it away from its siblings too soon? Yes I do agree that it is almost always a bad (or even deadly) idea to wean your parrot. Please don't get me wrong. I'm just saying it's possible to do so without killing your bird, or something like that. Weaning is a lot of work and most people just don't have the time to do it properly, what with jobs and activities. Unbeknown to me I was told that buying an unweaned Senegal is perfectly OK, so I bought one, he was 6 week at the time. Feeding was not an issue for me, he was fed 20ml morning and night. He is now 8 weeks and started getting a little hungry in the afternoons so I popped into my vet for some advice and recommended giving him a top up. Since he went into his cage 7 weeks I've had bird seed in a bowl buthasnt eaten it until today,he is eating the seed in his own. I definitely won't stop his formula 2x daily anytime soon, when should i start weaning him and how? One thing I have noticed is that he is not interested in his water bowl hence me keeping him on the formula. He eats a fair bit of fresh fruit, he enjoys oranges alot. Just be careful you don't feed him too many oranges. They don't need citrus to give them vitamins and too many can make them sick. Keep up with the forumala feeds. I'm not sure what age they wean at but keep offering food in the cage and he will wean himself when he is ready. As the previous poster said only give citrus fruit as an occasional treat. Offer more vegetables than fruits as they are more healthy and lower in sugar and you can allow small amounts of healthy human food like plain wholemeal pasta and rice too. Please consider weaning him onto a pelleted diet rather than a seed based diet, seed is ok occasionally too though. i actually work at a bird store, and do hand feed, and have had to go through a long process of training to do it, and the store only allows SOME people to do it for the hazards listed above. while they do sell unweaned babies (NOTE: THIS IS NOT MY PREFERENCE, I AM TOTALLY AGAINS IT) they require the owners to go through one on one training first and the owner has to complete a certain amount of time training before taking the baby home, and of course can always come in if they need help. that being said- i DO NOT advise anyone to buy an unweaned bird for that reason, especially if you don't know what you're doing because it does not make the bond stronger. most birds do not form bonds until after they are weaned anyway. trust me, it's easier to let someone who is trained and experienced to do it anyway, the last thing you want as a new owner is to have to worry about keeping up with scheduled feeding times, as well as worrying about whether or not you're going to harm the new baby. it really is not worth it. i've seen so many "accidents" where people who don't know what they're doing give their bird a crop infection. some birds can actually wind up traumatized from it. i always warn people to please, let us do it for the bird's safety. i've had many families opt not to do it themselves (GOOD) and come in to visit every few days, sometimes every day (even multiple times a day), to visit their baby and play and bond. a good store will allow you to do this, they will not push an unweaned baby on to you. it does not fulfill any bonding experience on the bird's end to "hold their bottle" if you will, i've noticed this is a more "human" thing. as mammals, we get that parental bond by nursing our young. birds do not. leave the hand feeding to the people who have been formally trained to do it, it saves you so much time, worry, and potential heartache.